Miss Potter - Renee Zellweger as Beatrix Potter - Wonderfully charming, touching, and emotional biographical film of the famous children's author Beatrix Potter. But this is not a childish film, though it starts out quite sweet as it sets up the Victorian period, Potter's family, and her personality as an imaginative artist and writer. Renee Zellweger's performance felt so personal and genuine. She communicates such a rich texture of emotions in this film, especially during the middle portion where life events invade Potter's imaginary world. Like other films set in the Victorian period, the acting must go well beyond the restrained vernacular of the time, and Zellweger's portrayal was simply exquisite. 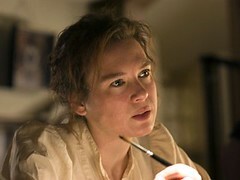 Miss Potter was clearly a labor love for Zellweger, who also helped produce the film. Ewan McGregor was perfect as Potter's publisher, Norman Warne. I was surprised, almost shocked, to see him in this role and its garb and mustache. At first, I thought he'd be out of place, but no. Ewan played his role wonderfully well, with such sensitivity and subtlety. And Emily Watson was also fantastic as Norman Warne's sister and Beatrix Potter's dear friend. I love anything Watson is in. Indeed, I'd like to see more of her. Director Chris Noonan (who also did Babe) held a light touch to this one. The story is a bit unconventional, but it works. However, I was a little confused by the way flashbacks where presented. One significant gap in the story - I really missed seeing Beatrix's brother Bertram as an adult. He was introduced in flashbacks of her childhood, and that left me wanting to see how he turned out as an adult. He's mentioned in a scene as having visited Beatrix, but the event is never on screen--I wonder if it was shot and cut. Keeping him out surely kept the film tighter, but neglecting that relationship left a big gap in the story that could have been filled with a couple brief scenes. Even so, I really loved this little film, Miss Potter. Renee Zellweger was a delight, as were Ewan McGregor and Emily Watson. Well worth seeing. Miss Potter: The Novel - by Richard Maltby Jr.
"I Don't Believe in Happy Endings"
What Movie Rating Would You Give Your Life? Thank You for Smoking Movie - Truthful Satire?